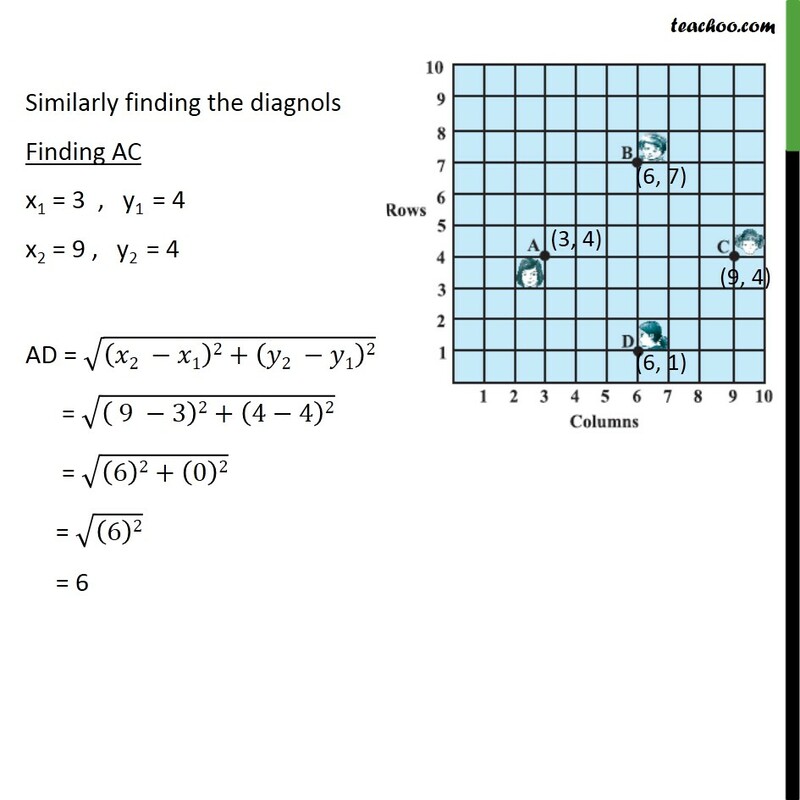 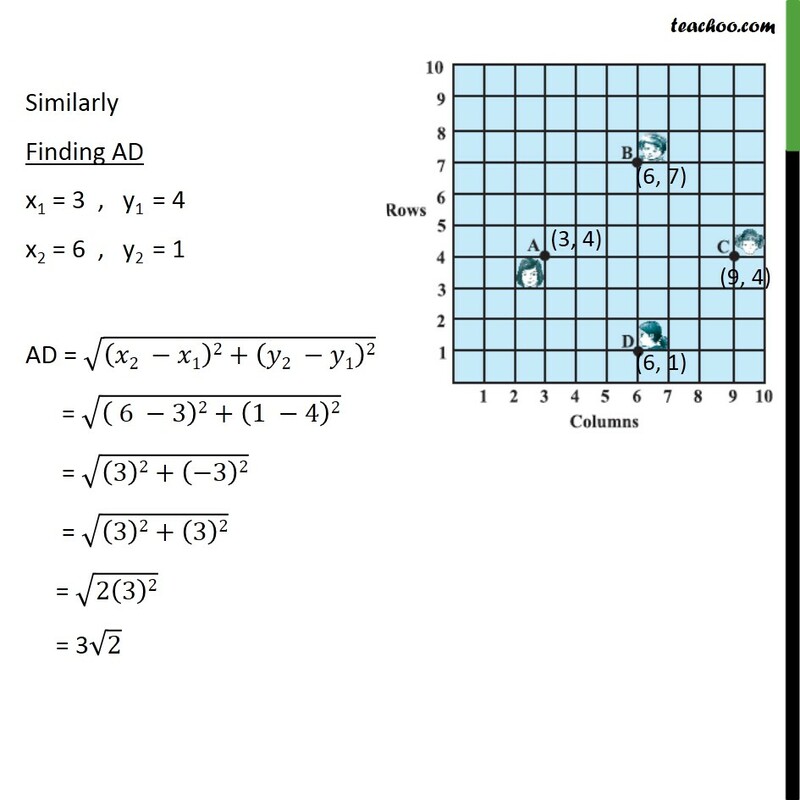 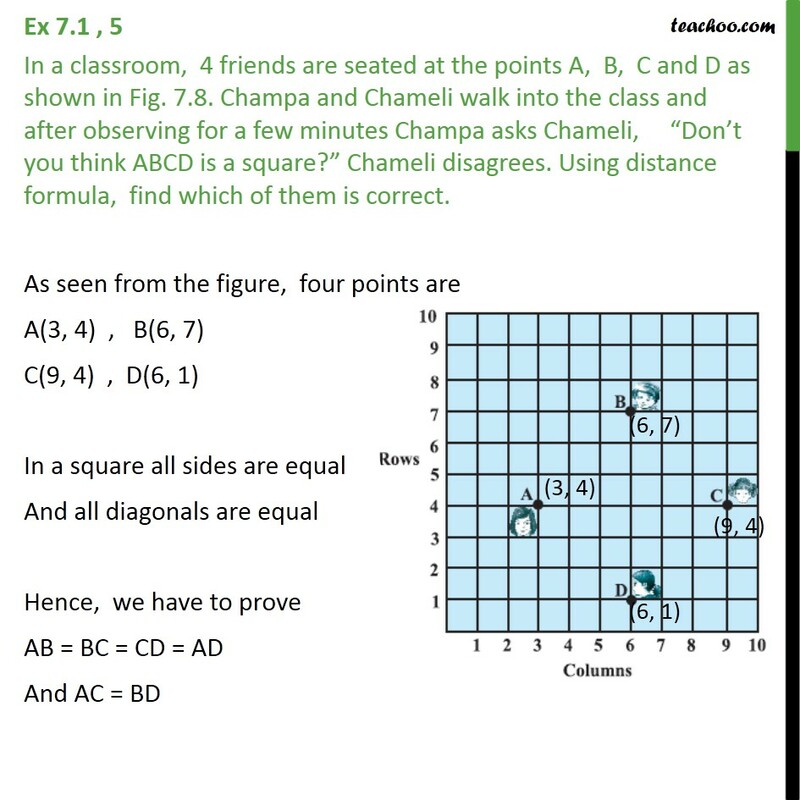 Ex 7.1 , 5 In a classroom, 4 friends are seated at the points A, B, C and D as shown in Fig. 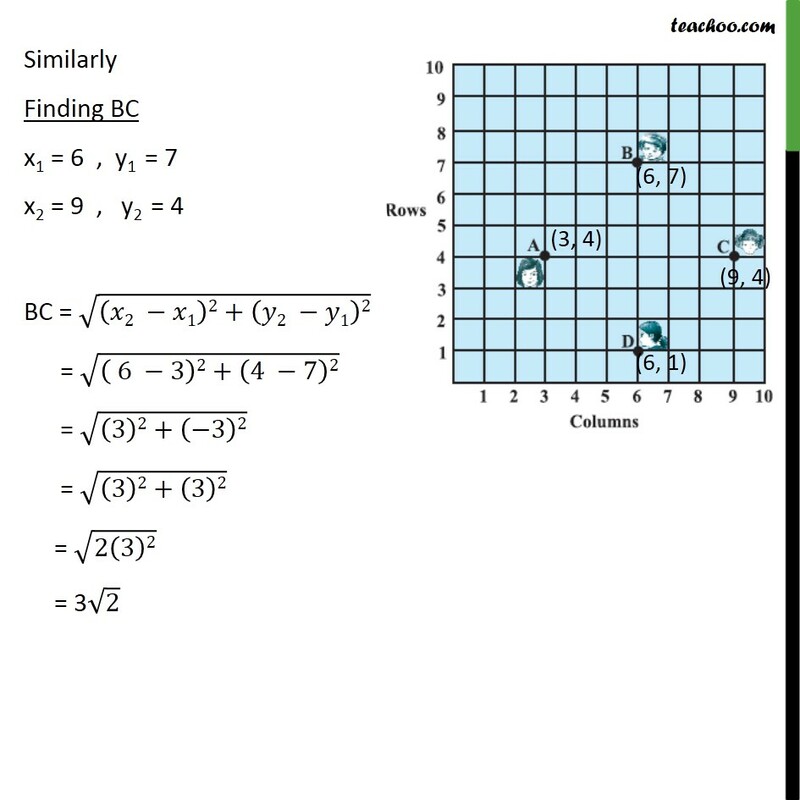 7.8. 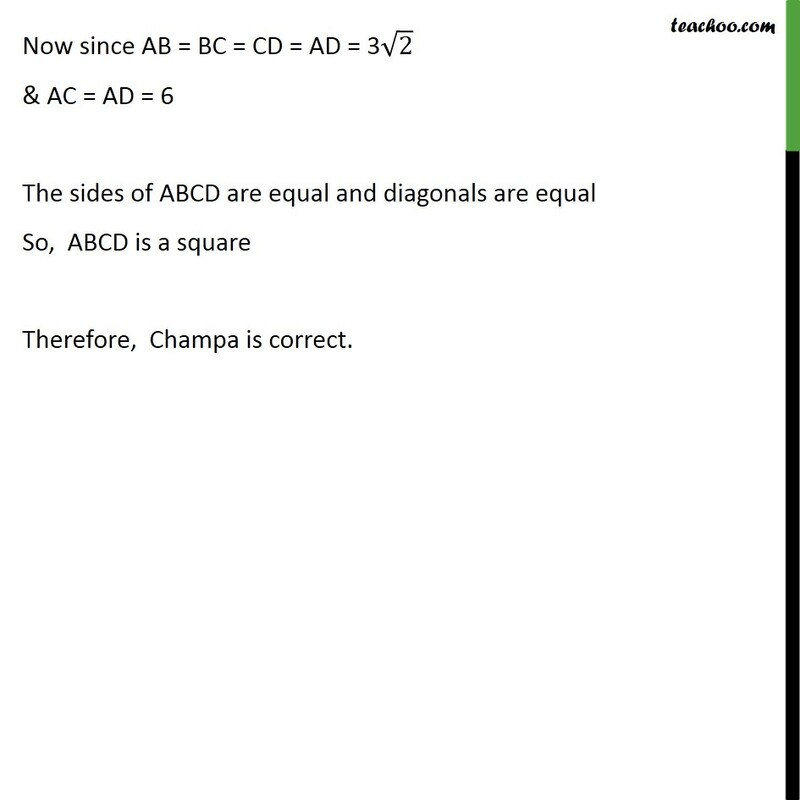 Champa and Chameli walk into the class and after observing for a few minutes Champa asks Chameli, “Don’t you think ABCD is a square?” Chameli disagrees. 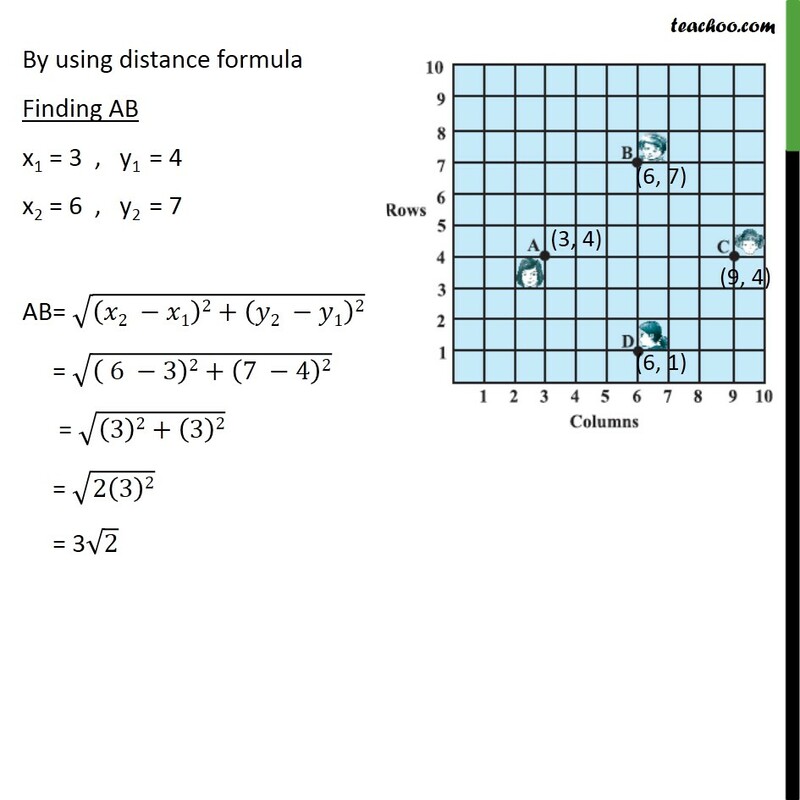 Using distance formula, find which of them is correct. 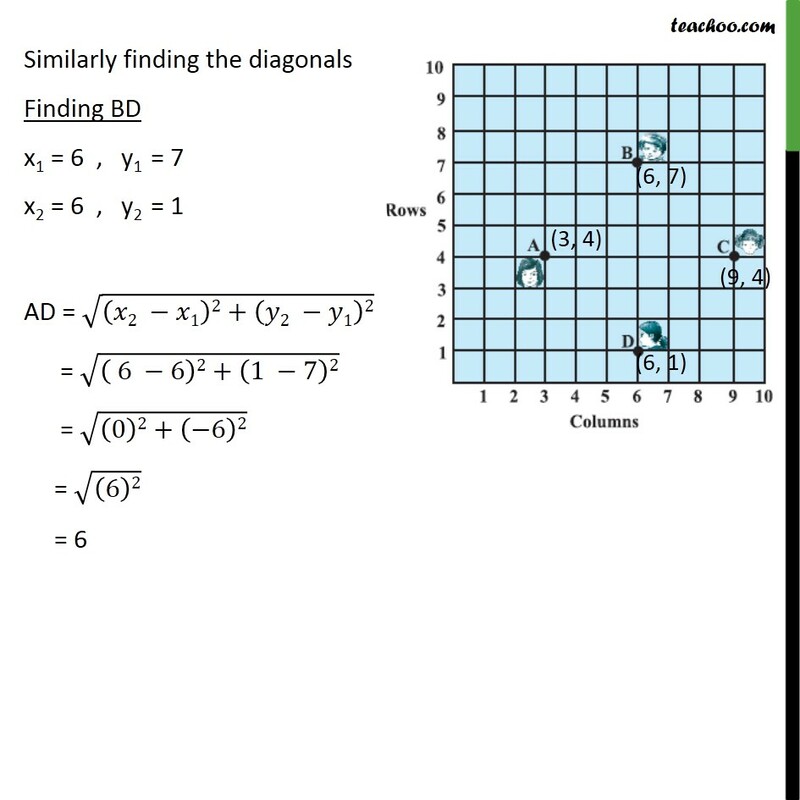 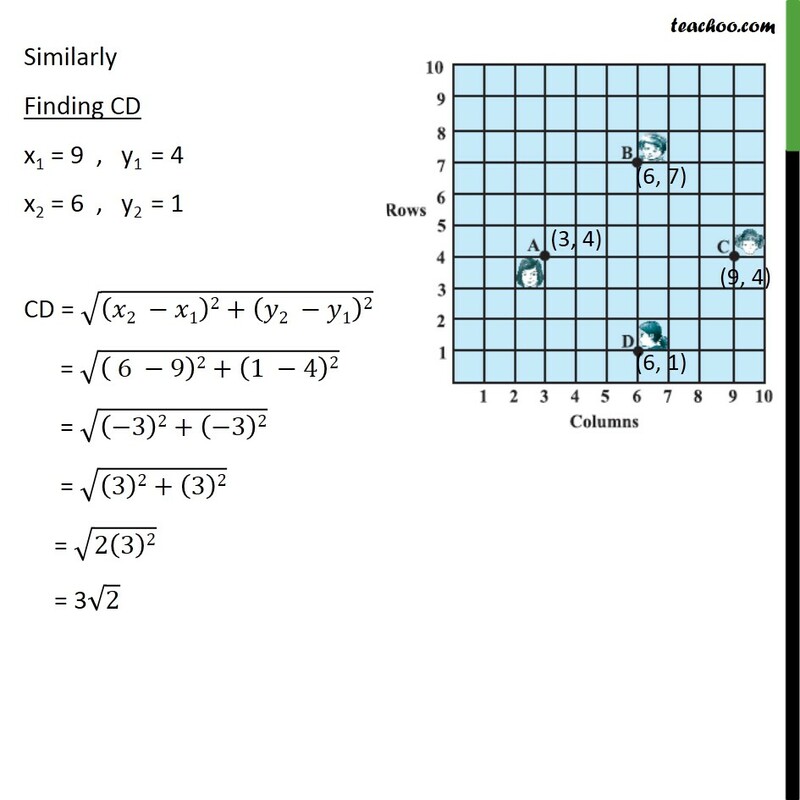 As seen from the figure, four points are A(3, 4) , B(6, 7) C(9, 4) , D(6, 1) In a square all sides are equal And all diagonals are equal Hence, we have to prove AB = BC = CD = AD And AC = BD By using distance formula Finding AB x1 = 3 , y1 = 4 x2 = 6 , y2 = 7 AB= √((𝑥2 −𝑥1)2+(𝑦2 −𝑦1)2) = √(( 6 −3)2+(7 −4)2) = √((3)2+(3)2) = √(2(3)2) = 3√2 Similarly Finding BC x1 = 6 , y1 = 7 x2 = 9 , y2 = 4 BC = √((𝑥2 −𝑥1)2+(𝑦2 −𝑦1)2) = √(( 6 −3)2+(4 −7)2) = √((3)2+(−3)2) = √((3)2+(3)2) = √(2(3)2) = 3√2 Similarly Finding CD x1 = 9 , y1 = 4 x2 = 6 , y2 = 1 CD = √((𝑥2 −𝑥1)2+(𝑦2 −𝑦1)2) = √(( 6 −9)2+(1 −4)2) = √((−3)2+(−3)2) = √((3)2+(3)2) = √(2(3)2) = 3√2 Similarly Finding AD x1 = 3 , y1 = 4 x2 = 6 , y2 = 1 AD = √((𝑥2 −𝑥1)2+(𝑦2 −𝑦1)2) = √(( 6 −3)2+(1 −4)2) = √((3)2+(−3)2) = √((3)2+(3)2) = √(2(3)2) = 3√2 Similarly finding the diagnols Finding AC x1 = 3 , y1 = 4 x2 = 9 , y2 = 4 AD = √((𝑥2 −𝑥1)2+(𝑦2 −𝑦1)2) = √(( 9 −3)2+(4−4)2) = √((6)2+(0)2) = √((6)2) = 6 Similarly finding the diagonals Finding BD x1 = 6 , y1 = 7 x2 = 6 , y2 = 1 AD = √((𝑥2 −𝑥1)2+(𝑦2 −𝑦1)2) = √(( 6 −6)2+(1 −7)2) = √((0)2+(−6)2) = √((6)2) = 6 Now since AB = BC = CD = AD = 3√2 & AC = AD = 6 The sides of ABCD are equal and diagonals are equal So, ABCD is a square Therefore, Champa is correct.